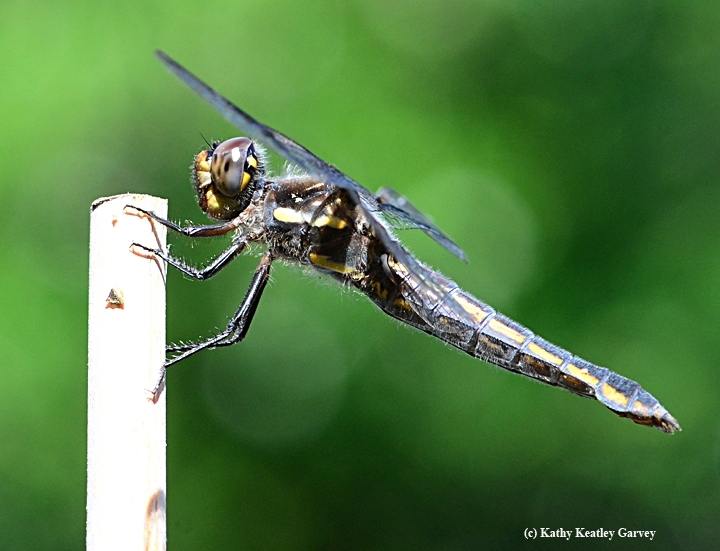 We watch them circle our fish pond, grab flying insects in mid-air, and then touch down on a bamboo stake in our yard to eat them. 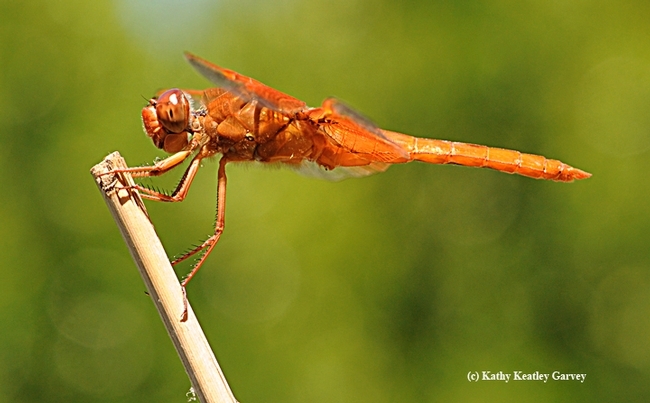 Some dragonflies stay for hours; others for what seems like half a second. Some let you walk up to them and touch them. Others are so skittish that they must have once encountered a nasty predator with a bad attitude and a big appetite unfulfilled. 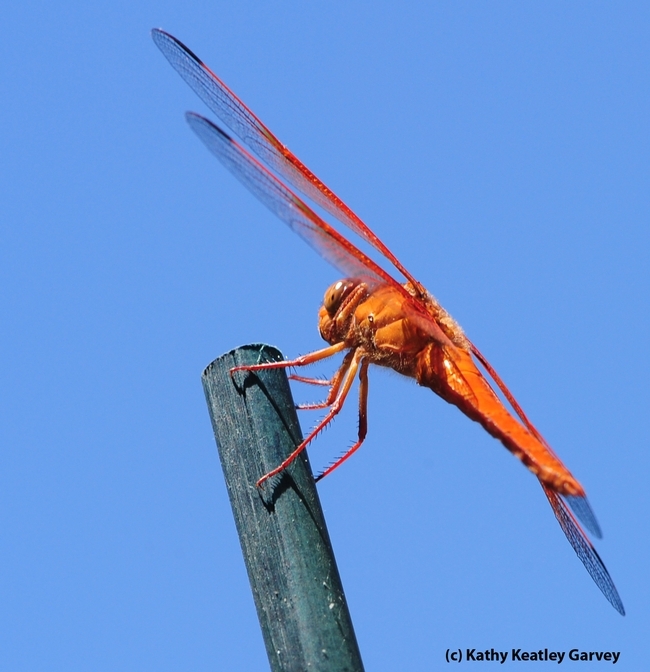 We've observed several different species in our yard (thanks to naturalist Greg Kareofelas of Davis, volunteer at the Bohart Museum of Entomology, University of California, Davis, for identifying the Sympetrums and the "widow skimmer," Libellula luctosa). Red flame skimmer or firecracker skimmer (Libellula saturata), a common dragonfly of the family Libellulidae, native to western North America. 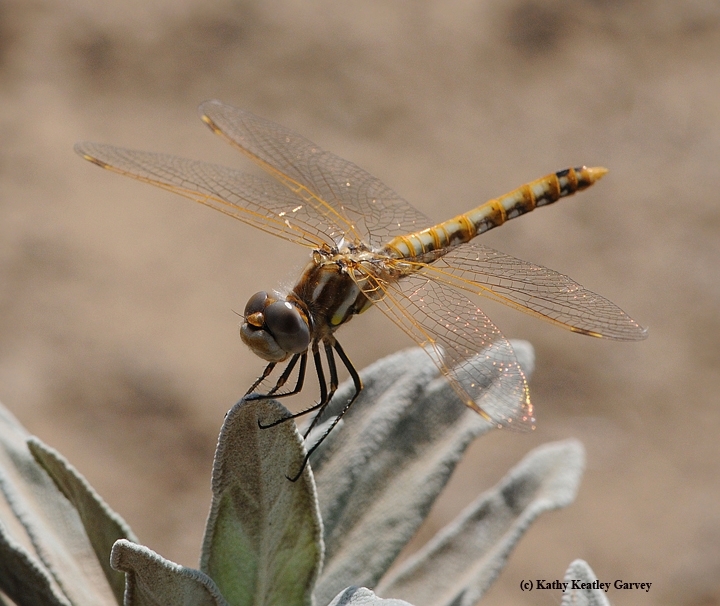 Variegated meadowhawk (Sympetrum corruptum), a dragonfly of the family Libellulidae, native to North America. Widow skimmer (Libellula luctuosa), part of the King Skimmers group of dragonflies that are found throughout much of the United States, except in John Denver territory (The Rockies). You can find them in parts of Canada, including southern Ontario and Quebec. 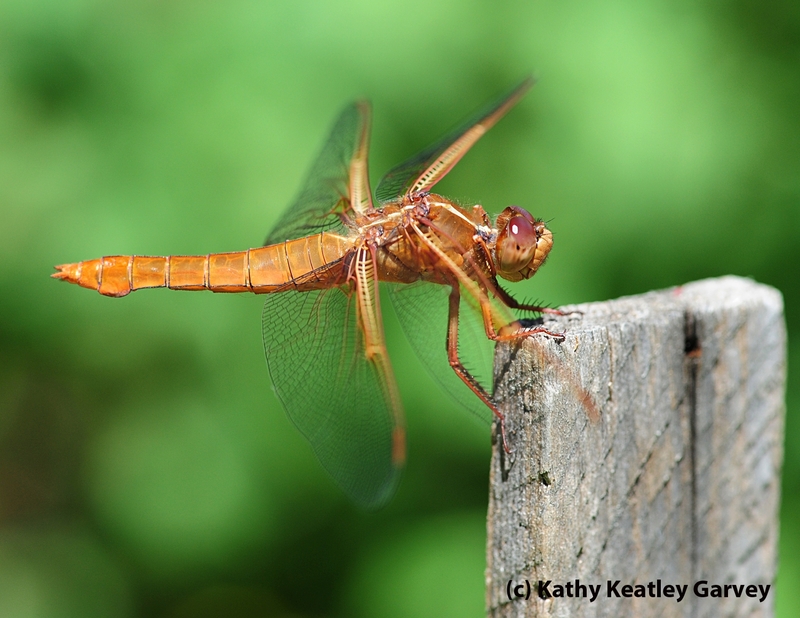 Can you believe dragonflies were some of the first winged insects that evolved 300 millions years ago? 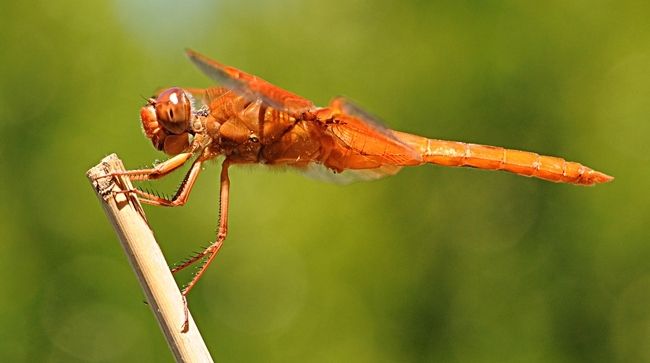 And that the order they belong to, Odonata, means "toothed one" in Greek? 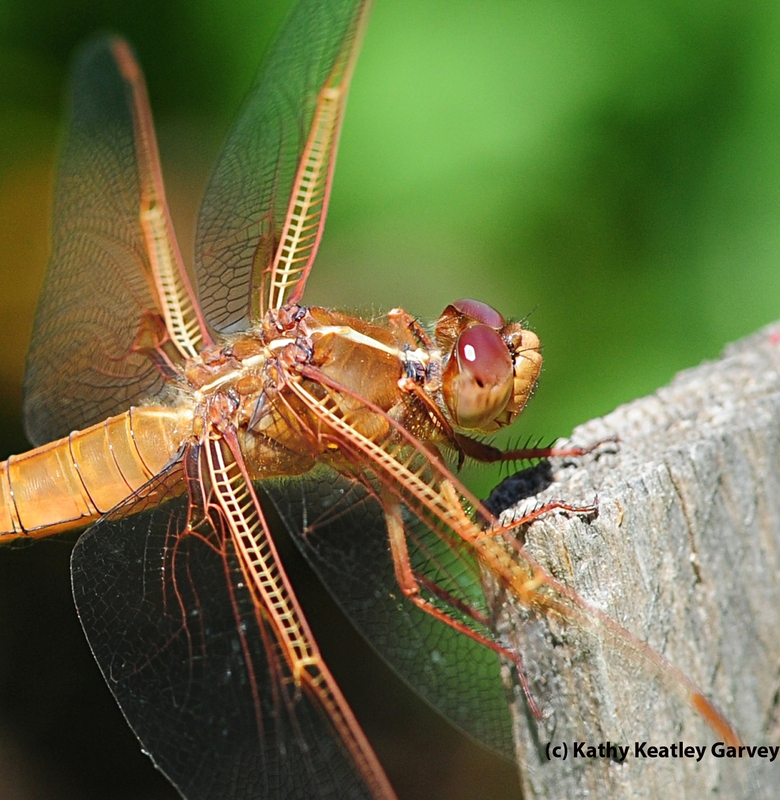 Can you believe that globally, we have more than 5,000 known species of dragonflies? Can you believe that dragonflies eat only the prey they catch in mid-air? And that they grab them with their feet? Umm, dead bee on the ground? No, thanks! 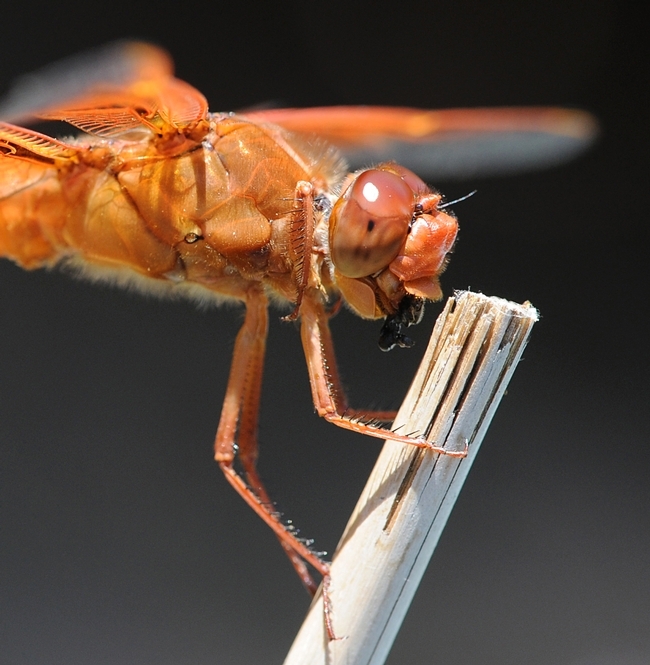 Can you believe that dragonfly called the globe skinner has the longest migration of any insect—11,000 miles back and forth across the Indian Ocean? For a close look at some of the Bohart Museum's collection of dragonflies, you can visit the insect museum, located in Room 1124 of the Academic Surge building on Crocker Lane, from Monday through Thursday, 9 a.m. noon, and from noon to 5 p.m. (excluding holidays). Admission is free. You can even buy dragonfly-related items in the gift shop. That would include posters (the work of Greg Kareofelas and Fran Keller) and jewelry. The Bohart Museum, directed by Lynn Kimsey, professor of entomology at UC Davis, houses nearly eight million insect specimens. And not just dragonflies, bees and butterflies. There are critters you've never seen before. And some, such as the Xerces butterfly (Glaucopsyche xerces), are extinct. The Bohart's next weekend open house, the last of the 2013-2014 academic year, is Saturday, July 26 from 1 to 4 p.m. The theme focuses on spiders: "Arachnids: Awesome or Awful?" It's family-oriented and free and open to the public. (For more information contact Tabatha Yang, education and outreach coordinator, at tabyang@ucdavis.edu). Of the many things I'm thankful for on this Thanksgiving Day, I am thankful for the millions of insects that populate our planet. Scientists have described more than a million species, but there may be 10 million more undescribed. I am thankful for honey bees. There is no more comforting sound on a warm summer day than the buzz of bees as they pollinate the plants and return to their colonies with nectar and pollen. I am thankful for their role in providing the fruits and vegetables that we eat. I am thankful for bumble bees, especially the endangered ones that struggle to overcome the tragic changes to their environment. Bumble bees are social insects but what developers and others are doing to them is definitely anti-social. 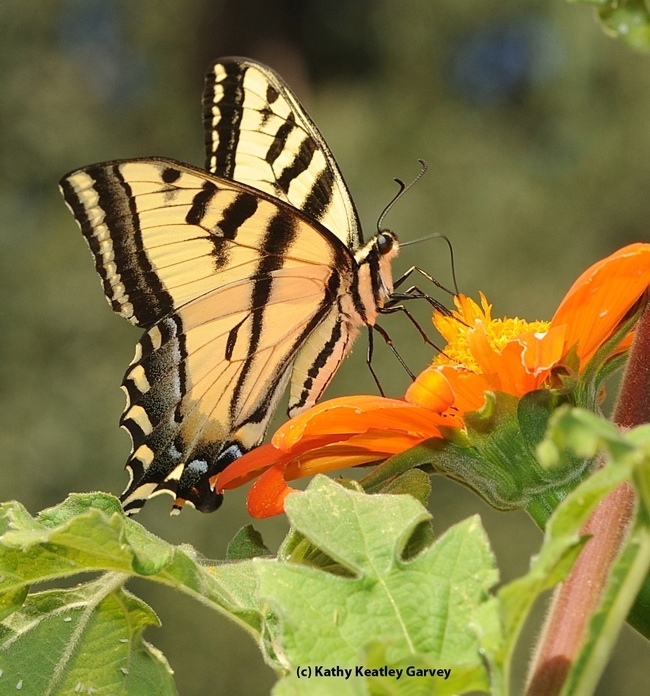 I am thankful for butterflies, nature's flying art that flutter in our garden and touch gently down on blossoms for a lingering sip of nectar. Their beauty overwhelms me. I am thankful for the pre-historic looking dragonflies that glide gracefully over our ponds and streams to snag mosquitoes and other undeirable insects. I am thankful for the insects that clothe us: the bees for pollinating cotton plants, and the silkworms for spinning cocoons. I am thankful for the beneficial insects, like honey bees, ladybugs, lacewings, assassin bugs, damsel bugs, soldier beetles, big-eyed bugs, syrphids, and parasitic mini-wasps. 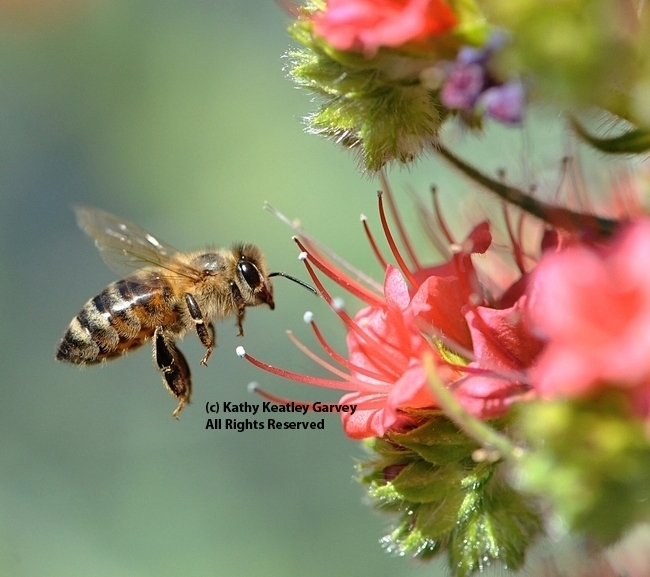 I am thankful for bee gardens, gardeners, entomologists and insect photographers. Frankly, I would rather spend an afternoon photographing insects in my backyard than sitting on a crowded beach in Hawaii with a little umbrella decorating a drink that I don't drink. I am thankful I don't engage in recreational shopping, collect pretentious possessions, or focus on five-star restaurants, especially when starving, ravaged and troubled souls sit forlornly outside. I firmly believe that Brown Thursday, Black Friday and Cyber Monday should not be an integral part of our lives, and that “greed” should be replaced by “giving." I'm happy with what I have. To me, it's important to “want” what you have, than to “have” what you want. Today I'm especially thankful for two Gulf Fritillary butterflies that just emerged from their chrysalids. The double emergence may seem like a “minor” thing to be thankful for today but it's the “minor" things that I treasure. And why "happy" should always precede the name of this holiday. It's not Superman. 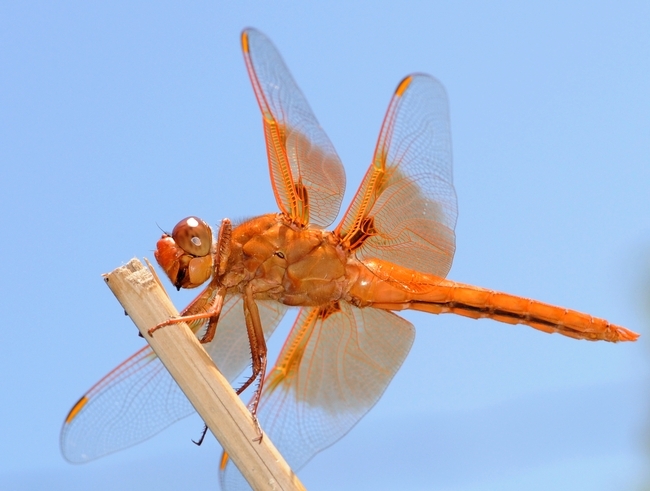 It's a flame skimmer dragonfly (Libellula saturata). 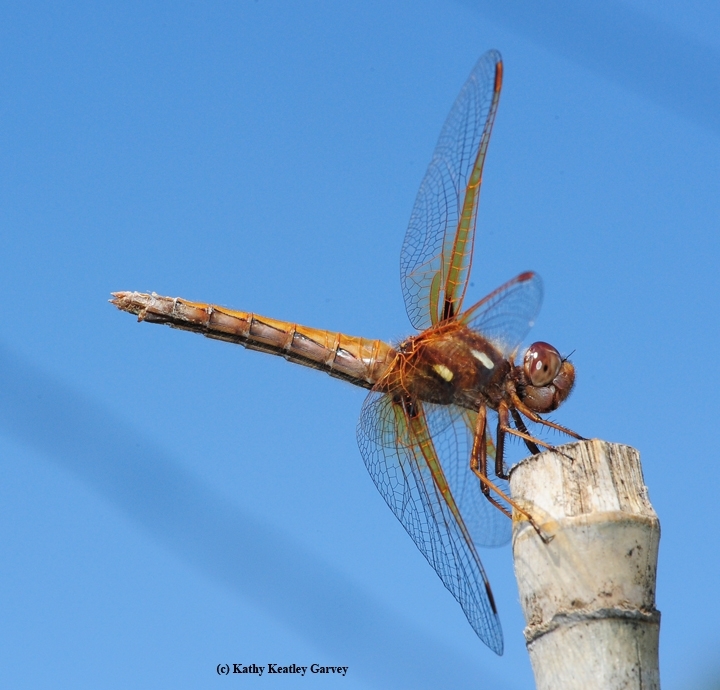 We spotted this dragonfly in our yard recently and crouched down for a low angle, framing it against the sky. 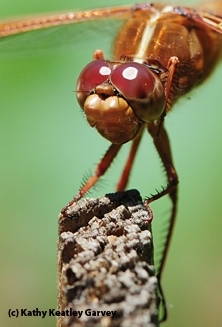 This is one insect that everyone notices and admires.